At coffee shops, white chocolate mochas are almost always made with some kind of white chocolate (or white chocolate-flavored) fudge sauce. They’re good, if sweet, but it’s hard to know exactly what’s going into the drink. It’s easy to make these drinks at home with regular white chocolate. Look for a brand that just has cocoa butter, sugar, milk (or milk solids, as they are sometimes listed) and vanilla in it. These tend to be higher quality chocolates with a smoother finish and better flavor. 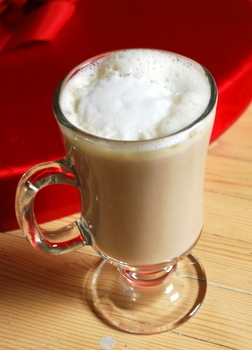 To make the drink, all you really need to do is melt white chocolate into milk, then add in your coffee or espresso before serving. I usually top white chocolate mochas off with some whipped cream, since the milk is already hot and doesn’t actually need to be steamed once the white chocolate has been incorporated. You can always whisk up the milk/chocolate mixture with a whisk to create some froth and aerate it a bit before adding the coffee, if you wish. Melt milk and chocolate together in a small saucepan, stirring frequently until very smooth and milk is very hot. Pour into a tall glass, then top with hot coffee. Finish with whipped cream, if desired. *If you’re making this with espresso, use 8-oz of milk for 2-oz coffee and the same amount of chocolate as above. For a larger drink, or one with more espresso, you might want a bit more chocolate.